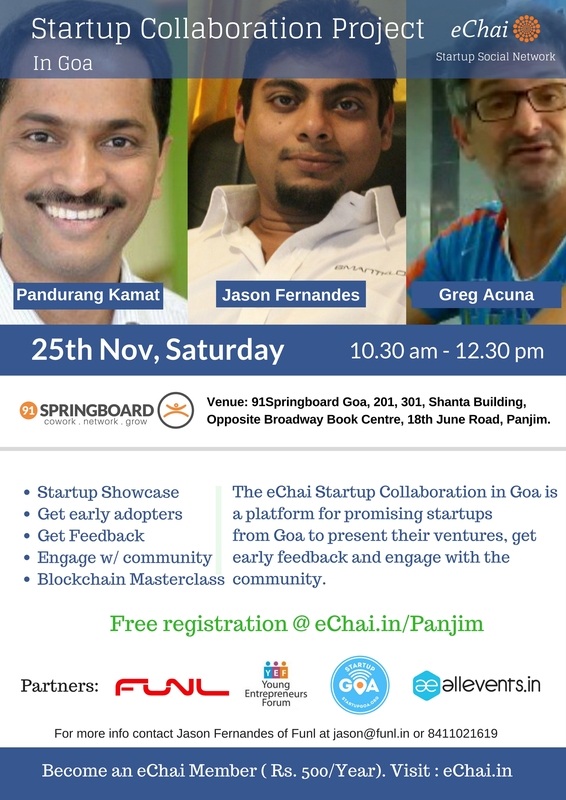 eChai Goa is hosting a Weekly Startup Collaboration Project this Saturday, the 25th of November. Clear your schedules from 10:30 to 12:30 pm to spend time with some of the names responsible for successful young businesses and a thriving startup ecosystem in Goa. This event would lay the groundwork for a weekly meetup moving forward. Every week eChai will work toward bringing entrepreneurs together. These entrepreneurs will partner on future projects or pursue independent goals, making eChai the nexus that drives new ventures. Startups from or around Goa would get a chance to talk about their business plans, engage feedback and ideas from other self-starters who have experience in the arena. The program is backed up by the FUNL, YEF – The Goa Chamber of Commerce and Industry and Startup Goa. The event will take place on Saturday, the 25th of November. Head down to 91 Springboard in Panjim to begin your networking journey. The event has three main goals that they would be looking to sort out. If you have a venture you would like others to hear about, shoot them an email about this and they will try to slot you in their schedules. A startup social network, eChai has had giant successful events and programs across the country. The group has a global network that they leverage to get their events better reach. This also allows them to keep up with global startup trends. eChai has also started a program allowing people to get a membership. People are allowed to pay Rs. 500 a year to get a seat. There are meaningful and long-lasting benefits to becoming a member of this initiative.